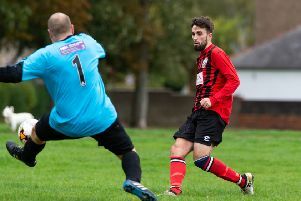 THERE were runaway away wins for Illingworth St Mary’s Reserves (6-1 against Salem), Elland Allstars (11-3 against Crossley’s) and Copley United (7-2 against Ivy House) in Division One of the Halifax AFL on Saturday. Illingworth, who are top on goal difference, fought out an even first half hour with Salem, both sides wasting chances. Saints took the lead when a fine Jamie Millar through ball released Brandon Field and he lobbed the keeper. Salem responded and the lively Ian King had too much pace for the Saints defence, breaking clearing and finishing well. Field regained the lead moments later with an excellent finish from the edge of the box. Tom Mcgregor finished well from a pinpoint Jamie Moorhouse cross and just before the break Mcgregor scored the goal of the game from long range to make it 4-1. Illingworth continued to dominate in the second half and substitute Morgan Eastwood added two neat finishes to round off the win. Denholme United are second, with a 100 per cent record, after battling to a 2-1 win away to Holmfield while two goals from Gary Binns helped Brighouse Sports get the better of Ryburn United Reserves by 3-2. Sowerby Bridge Reserves’ lead in Division Two was slashed to two points when they came a cropper away to Northowram Reserves, losing 4-1. Scott Singleton scored a hat-trick for the Rams, who were getting off the mark for the campaign in style. St Columba’s are second after making it four wins on the bounce with a 6-2 success at Midgley United Reserves. Midgley opened the scoring with a free kick before Ryan O’Neill equalised with a low left foot drive. Midgley regained the lead after defensive hesitation but Kutubo Touray equalised with a close range header and then Macauley Mountain gave Saints a 3-2 half time lead from a tight angle. Mountain lobbed the Midgley keeper before Frank Odion and Ben Caldwell added to Saints’ tally. FC Plummet Line made it three wins out of three with a convincing 7-2 victory over Greetland Reserves. Greetland had an early penalty appeal for handball turned down and Plummet took the lead soon after when midfielder Andy Frost rifled into the bottom corner from the edge of the box. Prolific duo Liam Calvert and Josh Hunt (two) took Plummet clear before Greetland grabbed one back with an excellent driving run and shot to the bottom corner. There was still time before the break for Calvert to grab his eighth goal of the season and for winger Kris Charnock to lob the keeper for a 6-1 scoreline. Ryan Barkham and Aaron Barkham scored six goals between them as Junction Inn demolished Sowerby United Reserves 13-2. Stainland United and Mixenden United climbed above inactive Flying Dutchman to take first and second places in Division Three. Stainland were 5-2 home winners over Shelf FC Reserves with the help of two goals from George Bainbridge while Chris Woodhouse scored a hat-trick in Mixenden’s 7-2 home success over FC Ovenden. Brighouse Sports Reserves completed a good day for their club with a 5-3 win away to Warley Rangers, Harry Scott-Baxter and George Aspinall each scoring twice. Shelf United bowed out of the West Riding County FA Challenge Cup,losing 2-1 to Route One Rovers when the game took place at the second attempt at Lightcliffe Academy. Ahsan Naveed and Iqbal Shoah were on target for the West Riding CA League visitors.